At the risk of sounding corny I do have to say that there is something magical about taking part in a national election. Today was my first time voting in my new home of Boston. The scene may have been unfamiliar and the method for casting my ballot was certainly different, but there was nothing foreign about waiting in line and making small talk with others in my community. I am as tired as the rest of you from the unending stream of commercials and phone calls, but the act of voting instantly washes all of it away. Another feeling came over me this morning as well. For the first time I was just a bit concerned that my name might not appear on the voter’s roll since I am new to the area. I even imagined being turned away. It doesn’t take much to reinforce just how important it is both as an abstract political right and as a personal value and obligation. Finally, it reminded me of the sacrifices that so many Americans have had to take to secure this right for themselves. In other words, get out there and vote! p.s. Make sure you thank a poll worker for volunteering to make it all possible. This reminds me of when my Grandfather, George Chandler was one of the first African Americans to vote in my hometown of West Point, Mississippi. He was so well respected that he was exempted from paying his pole taxes. One of the prominent white citizens wrote in the local newspaper that if any (“n word”) attempted to vote, he would personally take him behind the barn and whip him. My grandfather and one other African American, Dr. Thomas Zuber were allowed to vote. My wife and I have voted for a lifetime in California. I’m sure that there is some other locale in the United States that is as zany, however, the Golden State has not been the bastion of conservative thought since Ronald Reagan was governor. If anyone remembers the 60’s and 70’s, they probably weren’t there. Californians elected Governor Moonbeam the first time in 1975, but that wasn’t strange enough for Californians, they needed another dose of his mind-set in 2011, when he again assumed the office of Governor. The privilege of voting has always been an inspiring event for me. The opportunity to possibly influence change is thrilling. 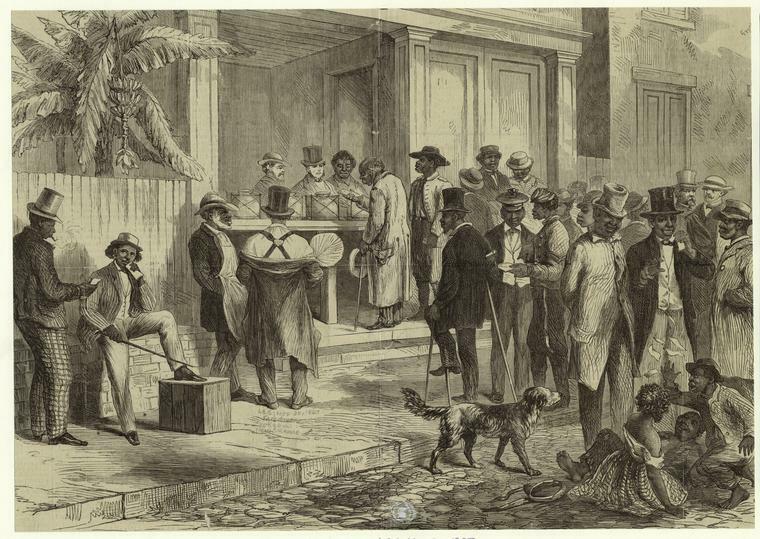 The comparisons and reflection on the presidential elections of 1860 and 1864, during our nations monumental crisis, reinforces a belief that every single vote counts and that every citizen’s voice can be heard. We registered to vote in a small north-Midwestern town, our new domicile, several months ago. We cast our ballots for the first time yesterday in one of the local churches and the whole voting process took less than 5 minutes. The atmosphere was neighborly, cordial, yet electric and my biggest fear of not appearing on the registration roll was alleviated by the big smile and the handshake-welcome of the towns registrar of voters. Bummer spends most days studying the history of the Civil War, the leaders, politicians, movers and shakers, the common man and especially the philosophy of governmental ebb and flow. Some have said that Bummer is obsessive, regarding Civil War analysis, living in the past and that history has no relevance on current events. Other’s opinion aside, the belief that a thorough unbiased understanding of past political conflicts and their causes is a dynamic basis for balancing decisions and peace of mind. Thanks, Bummer and well said. Next post: Four More Years!